Recently we were lucky enough to be invited to the Avid Space Melbourne and visit our friend from Avid, Drew Parsons. Drew set up this space to host training sessions and showcasing Avid’s equipment. The Avid Space Melbourne currently has an Avid S6, set up in 7.1.2 monitoring configuration, an Avid S6L and two workstations showing off their smaller controllers such as the Artist Mix and the Avid S3. The S3 is currently set up to showcase its use with VR audio. The Avid Space Melbourne resides in a creative hub in Kensington, which is home to Furstock Studios and Cooking Vinyl Australia. The building has a huge amount of character and creative feel to it. So Avid have picked the perfect spot to showcase their equipment. Further to this, the main purpose of our trip out to the Avid Space Melbourne was to check out the 7.1.4 Dolby Atmos setup. We wanted to get a deeper understanding look into the setup that is involved when working in an Atmos environment. You may be asking, what is Dolby Atmos? Dolby invented the Atmos cinema format in 2012. Atmos allows engineers to mix in a three-dimensional environment. Expanding on previous surround formats adding two additional channels, “Left Top Surround and Right Top Surround”. The end result is an immersive experience on playback. 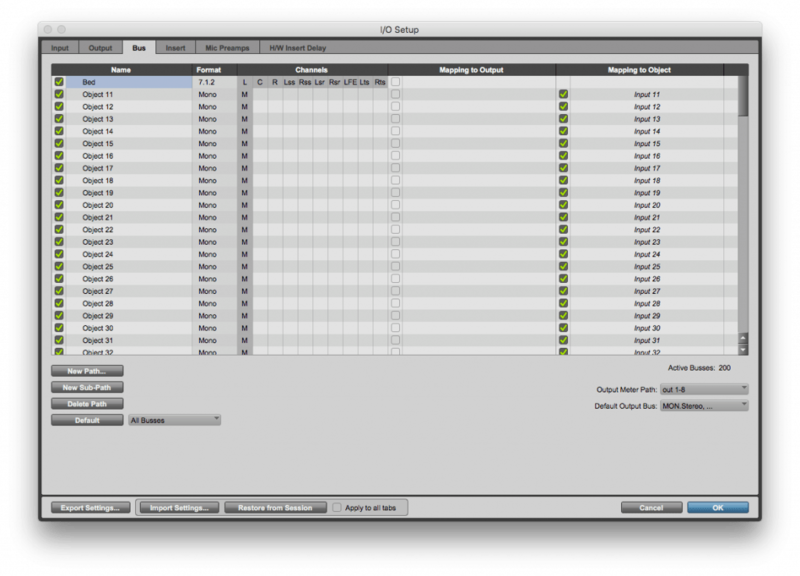 Since the release of Pro Tools 2018 ultimate, Avid added in the support of Dolby Atmos Native, 7.1.2 and 7.0.2 routing, a 3D panner that visually resembles a theatre space, which allows the engineer to pan an object anywhere within that theatre space, it also has predefined panning movements that can be used as presets. In addition to these new features, Avid has also been leading the way, adding in immersive audio workflows for working with VR, and encoding for 360 videos. *Note: The (7) refers to the number of surround speakers, the (.0 or .1) refers to the number of subwoofers and the (.2) refers to the number of overhead speakers within your system. Mixing Atmos in Pro Tools requires a Pro Tools Ultimate license, standard licenses do not have access to Atmos or surround bussing. Now, it’s probably best to go over some of Pro Tool’s restrictions first when working in a Dolby Atmos environment. Atmos mixing sessions, when working with a Dolby Rendering unit are limited to 48kHz sample rate. Avid recommends converting all audio to 48kHz, before working with the Dolby Encoding unit. The Dolby Atmos renderer supports most session timecodes, though the Dolby renderer only supports 24fps for cinema masters. Atmos sessions are intensive, Avid recommend setting your buffer size to the highest available on your system. I would suggest doing this in most mixing scenarios whether it be for film or music production. I would not see this as a restriction. This is a suggested setting to ensure the best performance out of your system. To add to this, if you’re working with Atmos or any surround formats your systems will be optimised for the highest performance and should be well within the supported specifications. Because running your sessions at the highest buffer size, should not cause any issues with your session. Before we discuss the hardware setup, lets quickly take a look over the bussing that is used while working within an Atmos session. As you can see below on the Output tab, the first 10 channels are used for the 7.1.2 “Bed” tracks. The remaining outputs are assigned to the MADI outputs, these will be used for the Objects. The Object busses are mapped to the MADI outputs via the Bus Tab. These ‘Object’ busses are used for any ‘Object’ tracks that require Atmos panning metadata. To render a mix in a Dolby Atmos Cinema environment requires a Dolby Rendering unit and this is required for all “Cinema” mixes. This ensures that all Atmos mixes are played back correctly in a theatre environment. Below, we will go over a basic hardware setup required to produce Cinema mixes. Let’s take a look over each piece of equipment required for an Atmos mix session. We will use the Avid Space Melbourne setup for this example. In this setup, The Avid S6 is connected via Ethernet to the Pro Tools system. This allows the engineer to have complete control over their mix. Consequently, the Avid S6 is the most advanced control surface on the market, it is highly flexible and allows the engineer to create their own workflow. As a result, the Avid S6 gives us complete control of any automation passes we wish to create, whether it be panning, or slight level adjustments to our mix. The two HD MADI units, receive the “Bed” tracks and any assigned “Object Tracks” from Pro Tools, they receive these via the two Digilink cables connected to the HDX card(s). In this setup, the MADI units are handling all of the MADI I/os required for mixing in Atmos. The MADI outputs are then fed into the Dolby rendering unit. Similarly, this then encodes/decodes the “Bed” tracks and the metadata stored with the ‘Object’ tracks. The outputs from the Dolby rendering are connected to the Avid MTRX for monitoring on playback. The outputs are connected to our speakers and the MTRX handles all of our speaker management. 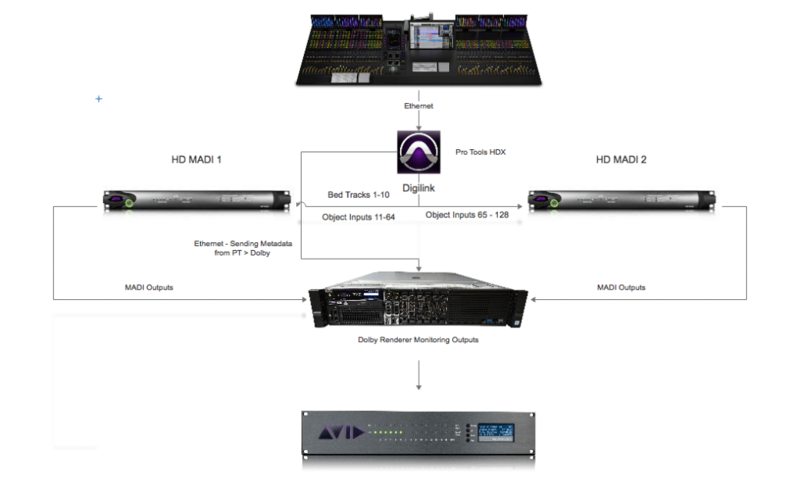 *Side note: The Avid MTRX is a highly-customizable unit. It could be used to replace the two HD MADI i/o boxes by adding the duel MADI cards. If you were by chance looking into setting up an Atmos mixing room, I would suggest looking at the Avid MTRX loaded with Dual MADI cards. This may be a more cost-effective solution. Now you may be asking, what are Objects? Objects are mono or stereo audio sources, that have had panning metadata applied by using a Dolby panner. The metadata is decoded by the Dolby rendering unit to ensure that these objects are placed in the correct space within the Atmos environment. The common example used to describe this is, a helicopter flying overhead from behind the viewer and to the front of the theatre. The helicopters panning metadata is embedded in the object track. So this allows Dolby certified units to decode the metadata on playback. This ensures that pan data is placed in its correct positioning, whether it be in the theatre or in the home cinema space. The decoding will ensure that the object plays to the correct speakers. The Dolby RMU is used to encode all of is data into a Dolby Atmos Master file, this includes all audio bed tracks and objects, one metadata file and one top-level file that provides information about the files contained within the master file. Next, let’s take a quick look into the Dolby Atmos Monitoring software below and quickly go over the information available to us. If you take a look at the screenshot below, The yellow circles are indicators for the 128 channels coming from the MADI connections into the Rendering unit, including the bed tracks and our object tracks. Because of this, we have meters for each surround output, our room configuration and lastly our Object view. The Object view gives us a visual representation of the theatre space, showing any panning metadata that is currently happening during playback. Lastly, to ensure that our mix is represented correctly, we need to tell the RMU what our speaker configuration is. On the bottom left is a visual of speaker configuration connected to the system. Irregardless the amount of the speakers we have in our space, the render will ensure that the source is placed in the correct speakers. 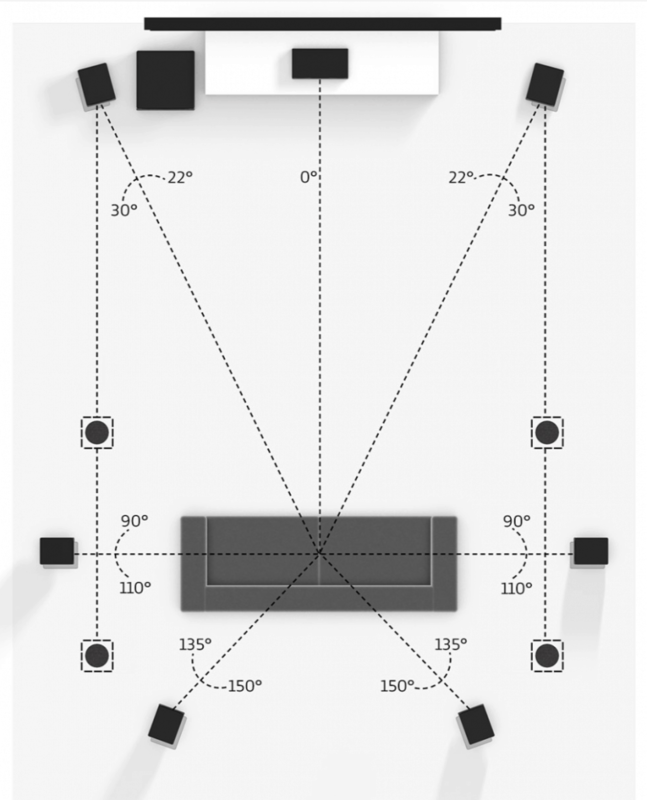 In the example below, the RMU configured for a larger mixing stage or theatre, though if we were to use the Avid Space Melbourne for an example, we would only see the speakers set up in the space. While typing this, I was thinking to myself, what does Atmos mean to the general consumer? Also, Different audio formats come and go. Because even 5.1 surround sound never took off in the household. We have all been in that house that has a “5.1 setup”, but nothing is correctly positioned. My personal favourite, having the rear speakers placed along the front of the TV. Will the general consumer notice any difference in their home setups? Samsungs Atmos Bar for example, has 17 speakers, including speakers that are up-firing and side firing. Likewise, Streaming services like Netflix, Hulu, Youtube and even Facebook now support Atmos. Atmos is now available to more homes than any other format. I do think that this will help bring Atmos to the general consumer and I personally, hope that it does. Furthermore, I have not had any personal experience with the Atmos Soundbars. Due to this, I will not comment on the quality of sound or imaging. After all, we could spend around a thousand dollars for an entry-level home setup or spend upwards of ten thousand, for a complete Atmos experience. Finally, I am excited for the future of Dolby Atmos and immersive audio. Both formats have been around for some time, however, we are now seeing the results of experienced Atmos mixing engineers. Experienced engineers push and develop new mixing techniques to drive the 3D aspect of the mix. This article is purely focused on Atmos and the Avid Space Melbourne. For this reason, I did not go into immersive audio and the potential that it holds, not only for VR but for the future of Live Sound production. I’m looking forward to seeing what artist’s can do with this type of technology and the engineers who can create a completely immersive audio experience in a live show. Above all, I would like to thank Drew from Avid for inviting us out to the Avid Center Melbourne, showing us around the beautiful space, and introducing us to some of the other Engineers who work out of the building, we really appreciate the time taken to show around. Do you like these types of topics? Are you interested in remixing music or are you aspiring to be a music engineer or a music producer? You can actually learn more by getting music production courses and audio production courses in Melbourne! Learn more about audio engineering and music engineering in an audio college in Melbourne today!